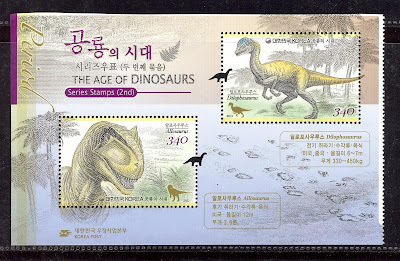 After the Triassic dinosaurs in August 2010, Korea Post released on August 11, 2011 another set of 4 stamps of denomination 340 won each, this time on Jurassic dinosaurs of the Mesozoic Era. 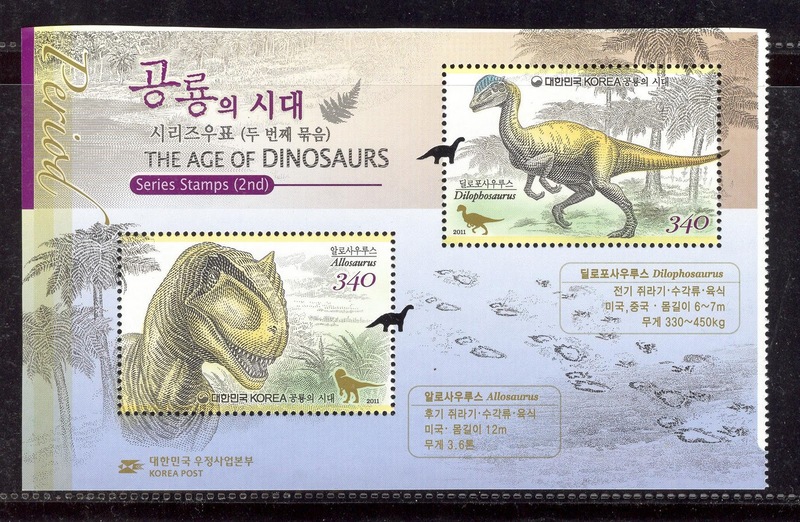 Jurassic Period of the Mesozoic Era, which spanned about 50 million years from about 199.6 million years ago to 145.5 million years ago, refers to the period that followed the Triassic Period. In this period, giant reptiles such as dinosaurs thrived on the land, and ammonites, in the sea. In the later part of the Jurassic Period, birds appeared for the first time. The Scelidosaurus was an herbivorous dinosaur, it had a rather small head and small body, being 250 kg in weight and about 4m in height. It walked on four legs. With its hind legs being longer than the front legs, it is thought to have run with its hind legs and to have walked with its hind legs to reach and feed on the leaves of tall trees. Its most prominent body feature is the oval-shaped dermal scutes on both its back and tail. It was discovered both in the U.K. and U.S.A. The Stegosaurus was an herbivorous dinosaur too, living during the Late Jurassic Period and with spikes on its tails. Compared to its large body, its head was relatively very small, with its long hind legs and short, crooked front legs making its back crook forward. With its large body, it moved very sluggishly. It is 9 m in height and 2 tons in weight. It was discovered in the western part of the U.S.A. The Allosaurus (left), on the other hand, was a carnivorous dinosaur flourishing in the later part of the Jurassic Period, it is known to be the fiercest predator in the North American continent. Its feature is the crests just in front of its eyes. It also had a sturdy jaw and teeth made for killing herbivorous or other carnivorous dinosaurs, as well as the hand which had sharp claws. It was 3.6 tons in weight and 14m in height and it was discovered in the western part of the U.S., Portugal and Australia. The Dilophosaurus (right) was also a carnivorous dinosaur during the Early Jurassic Period, it had two crests split in the shape of a V on top of its head. Its razor-sharp teeth, long and strong legs, and long claws were perfect for hunting. Its first toe on its hand was shaped in the way to hold a prey, functioning like a thumb. It was 330~450 kg in weight, and 6~7 m in height. It was first reported in the U.S., with the possibility of having been discovered in the southern part of China being raised. Wonsik also enclosed the 2010 issue. 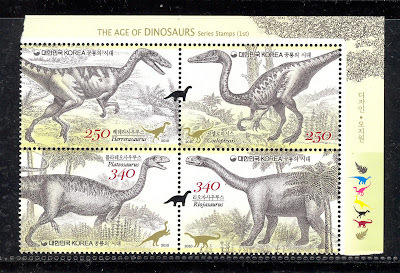 The 250 won stamps depict the Herrerasaurus and the Coelophysis (carnivorous), while the 340 won ones illustrate the Plateosaurus and the Riojasaurus (herbivorous). 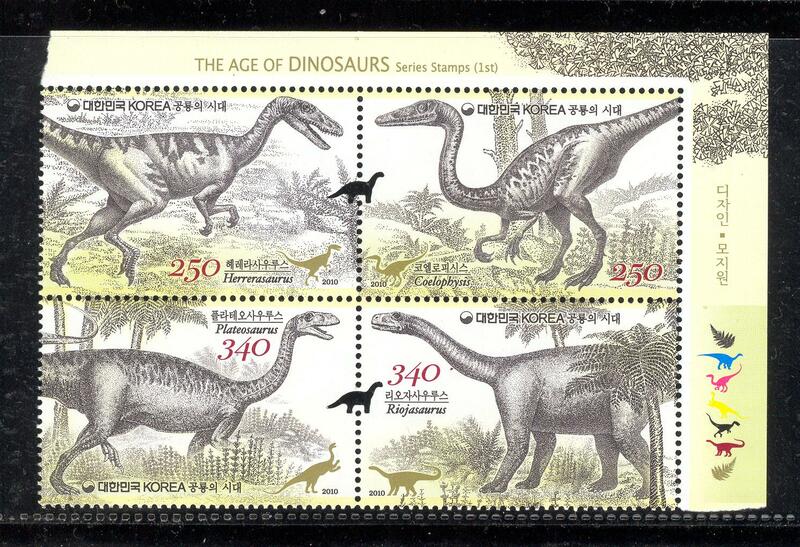 Note the very interesting dinosaur-shaped notches associated with these issues.